We have teamed with an innovative local company to bring you a new and improved method of locating these troublesome leaks. Our 6.0 Powerstroke IPR air test fitting takes the place of the IPR valve, meaning that the system can be completely sealed so that even the smallest leaks can be detected. These tools are built to last a lifetime with professional grade components. They are constructed 100% in the USA (with the exception of a high-quality German made shutoff valve). The heavy-duty Eaton hydraulic hose is rated up to 5,300 PSI. Each tool includes three extra o-ring sets for the IPR fitting. 2. IPR replacement fitting only - This cost-saving option is intended for lower volume users such as individual truck owners. At less than the cost of one hour of diagnostic time in most areas, this tool can save your hundreds or even thousands of dollars. 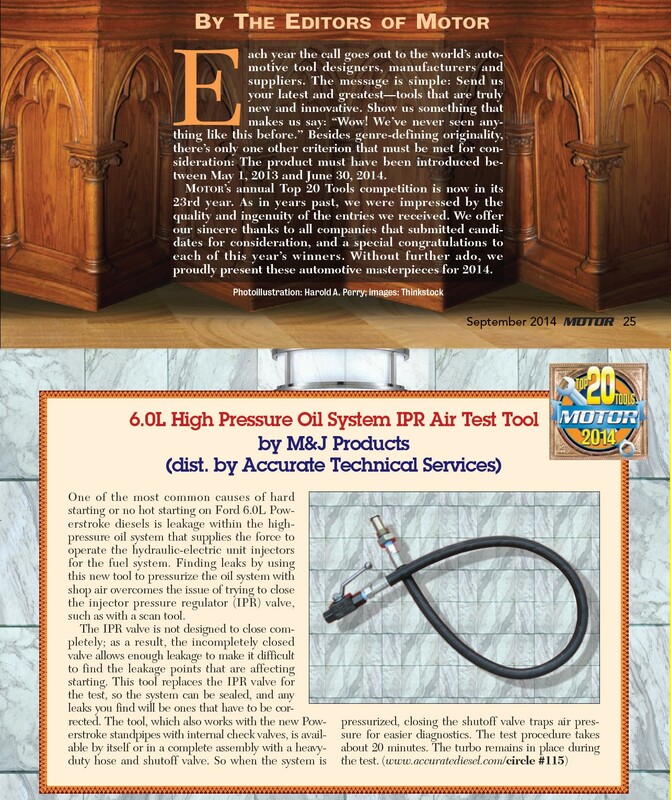 - The complete system can be tested in under 20 minutes - in a professional repair facility this high pressure oil pump test tool will pay for itself after one or two repairs. To connect, just remove the air cleaner, FICM, and coolant degas bottle (Turbo removal is NOT required). Remove the IPR valve and thread in the tool, hand tightening using the hose is sufficient. - As with any air tool, you will need to add your own air line quick-connect fitting. Since there are so many various air fitting in use, it is impractical to provide this part. Special offer: Add a 7.3L fitting to your tool and save $10 versus buying separately. The 6.0L and 7.3L fittings can be quickly swapped from the hose / valve assembly. Select option below if desired.